It’s 3 weeks until we go away so I’ve started to purchase suncreams etc. Must say I’m absolutely loving Amazon prime…every time I remember something I pop on the app, swipe to buy and it’s here the next day! We moved house in November and I haven’t really met our new postman but he won’t leave anything at all in safe place so I have drive over to Snodland to collect everything. Even the name of the place makes me feel put out! The amazon delivery people don’t care and just leave deliveries anywhere and everywhere so I much prefer them. I’m not usually this organised. I tend to leave thinking about packing for the day before we go and I always seem to be buying toiletries at the airport. I remember telling a colleague this and her panicking for me! This time I really need to keep costs to a minimum…I’ve overspent in recent months and the accountant in me is worrying! 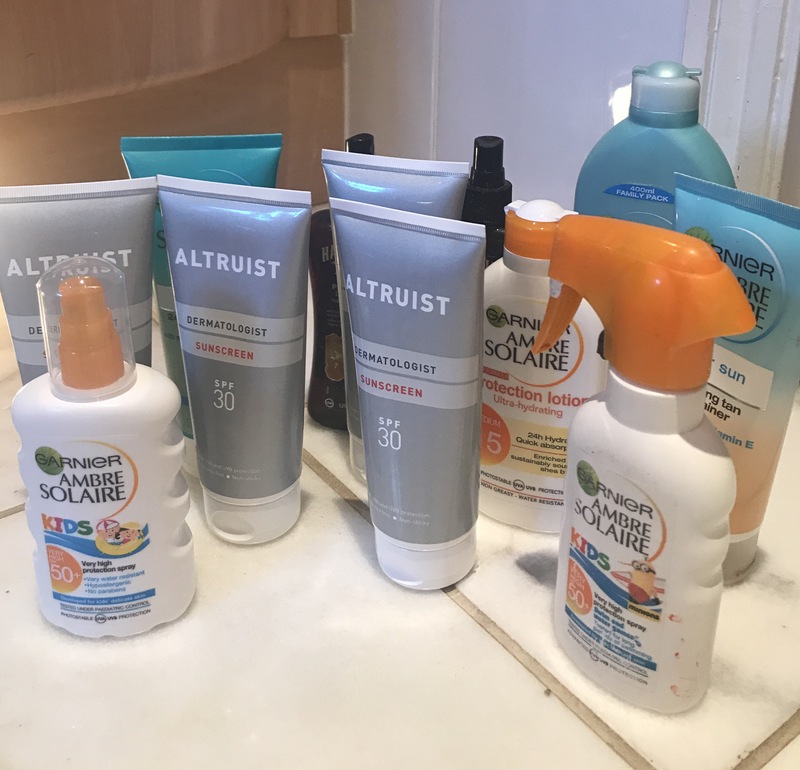 I’ve been trying to decide how much suncream we need to take with us. I really don’t want to have to purchase any whilst I’m out there as it’s so ridiculously expensive but we are going for 3 weeks and we are only taking 3 cases between us. It’s £45 for a 20kg case so I refuse to buy another. But then I don’t want to be buying more suncream when we are out there as it’s so expensive. 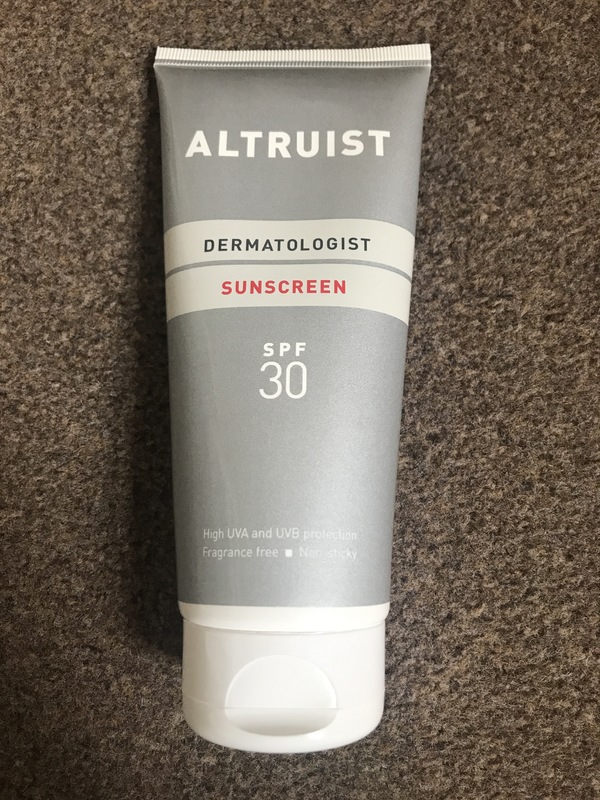 A good friend has recommended a new suncream to me. It has been designed by her husband’s dermatologist. 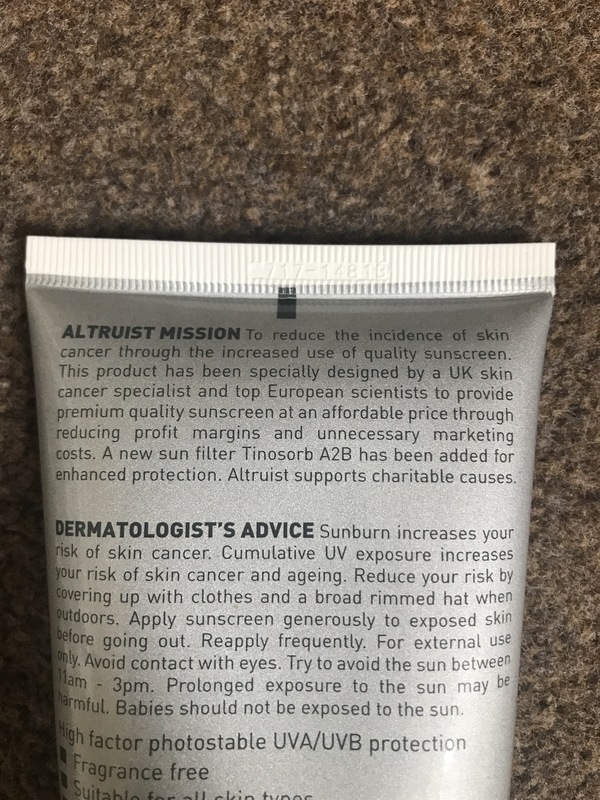 It’s been created with the idea of making suncream cheaper so that people use it more. I always get annoyed that suncream is so expensive as it is so important to use it especially on the kids. The kids have always been good at having suncream put on as I do in a morning when they have no clothes on so I don’t miss any bits. But after I showed them the video for Altruist they now insist on having more on in case I’ve missed bits. It’s the number one seller on Amazon. It’s £8 for 2 x 200ml bottles of factor 30 and £7.50 for 2 x 100ml bottles of factor 50. It’s a bit hard to find the factor 50 as it’s one of the options within the factor 30 purchasing rather than being it’s own page. Those that know me will know how in the past I’ve been terrible about wanting a tan! I’ve used sun beds and often haven’t worn suncream on holidays. But going away for 3 weeks I really need to protect myself from the sun’s rays so I’m going to be trying the factor 30 and so is Steffan! The kids wear UV tops so don’t actually need that much cream on their bodies so I’m wondering if 1 bottle each for the 3 weeks is enough and then 2 bottles each for me and Steff…and maybe a spare? So at least 8 bottles of suncream! That’s one luggage allowance in itself and don’t forget the aftersun. I’m getting very worried it’s not all going to fit. Might have to buy one of those suitcase scales as it’s going to be very close to the limit.